two peas & the dog: food. 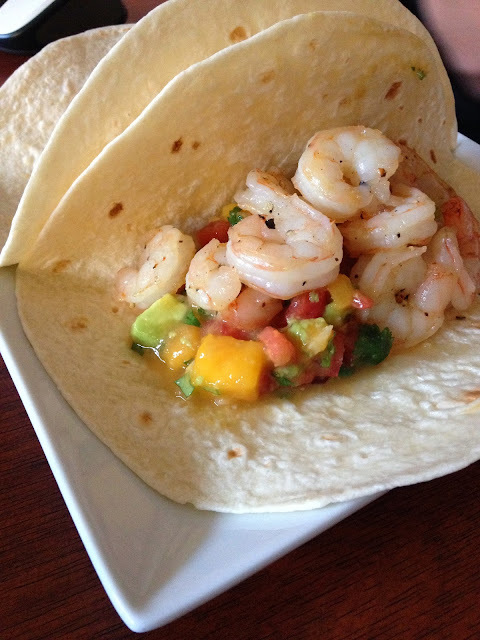 prawn tacos. about the recipe until making our menu this week. Quick, easy, delicious - the salsa is even better the next day! Note: Original recipe is Shrimp Tacos but we don't have shrimp in Australia and this isn't a salad. Spend the money to get some local prawns from your seafood guy. Mix together the following ingredients in a big bowl: mango, avocado, tomatoes, coriander (cilantro), red onion, 2 of the 3 garlic cloves, salt, and lime juice. Cover and refrigerate to let the flavours mix together. Heat some olive oil in a large pan, add 1 garlic clove. Let it do it's thing for about 2-3 min. Add your prawns and cook until pink. When ready, just dish up your tacos! Prawns + salsa = bomb(.com.au for my sister). I am currently on a sriracha kick so I added ample amount of the stuff to my tacos. Nate did mention it didn't need it - for anyone thinking it wouldn't be good without the kick of heat. We finished off an open bottle of Patrick of Coonowarra, 2013 Mother of Pearl Sauv Blanc. cellar door. rockford wines barossa.